DIY Homefit Ltd. has a unique offering with regard to fitted bedroom furniture. 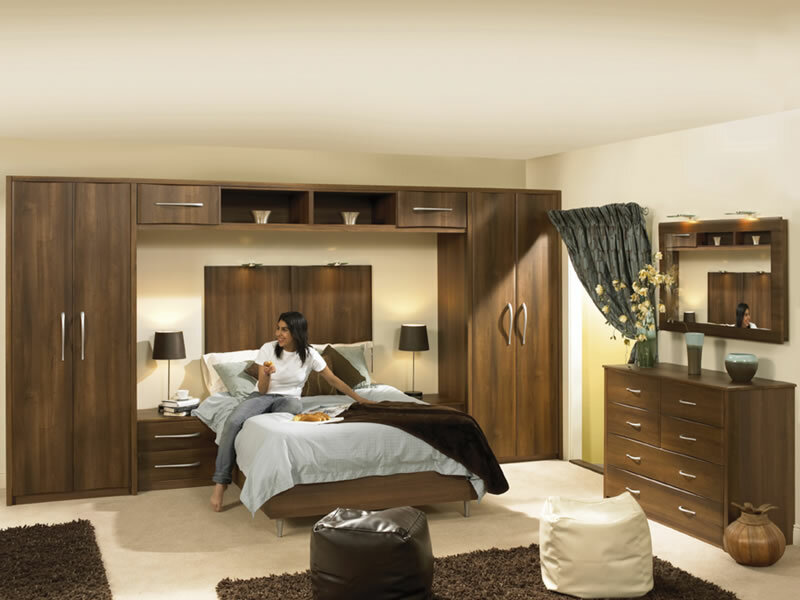 We have the flexibility and capability to create fitted bedroom furniture to the exact dimensions and mix of colours that YOU want. For example we have supplied dark walnut carcasses with high gloss cream doors and, for a different customer, black carcasses with satin white doors – not to mention the more usual matching bedroom doors and carcasses as shown below. If you want to get straight to the Bedroom Wardrobes, Cupboards, Dressers and Chests of Drawers or to the Bedroom Wardrobe Doors please click the text. We are able to supply carcasses and the appropriate doors and/or drawer fronts that will fit into whatever space you have. This truly made to measure bedroom furniture that not only looks as good as the high street equivalent, but in many cases it is actually constructed far more rigidly and strongly than the typical bedroom product. Our carcasses use an 18mm solid high density MFC construction with the backs also made in 18mm MFC (compare with the hardboard or 6mm MFC backs that you usually get!). These solid backs are the secret of long-life and rigidity and give you "fitted bedroom furniture" that you can take with you should you move house. We have had very positive comments from within the trade regarding the build quality of our wardrobes and drawers. The door and drawer fronts are made with the highest quality ‘pressure’ vinyls which are thicker than the more common ‘wrapping’ vinyls and these are applied to a top quality, premier grade (uniform density), 18mm MDF which has been temperature and humidity conditioned before use. All of our manufacturers use numerically controlled robotic machinery which allows both cupboards and doors to be accurately made to the nearest millimeter, which means the final result is a made to measure top quality product at an off-the shelf price (made to measure is no additional cost). Although MFC and Vinyl are different materials and therefore carry colours slightly differently, we are able to achieve excellent matches between most doors and cupboards – no longer do you have to have ‘white or light woodgrain’ carcasses! Each door uses a carefully-selected, industry-standard melamine back to either match or contrast with the front; then in many cases we can match this to the same standard melamine finish on the MFC carcass. So, for example, you can have dark walnut fronts and dark walnut carcasses (as in the picture above), or beech with beech, vanilla with vanilla or even high gloss black with white! As a final touch to the co-ordinated, made to measure look of your fitted bedroom furniture, we can supply the dresser and chest of drawers tops with profiled edges to match the wardrobe doors or drawer fronts of the rest of the furniture. It is possible to make these selections entirely within our buying process but we do recognize that buying made to measure fitted bedroom furniture can be quite a complicated process so we are happy for you to give us a call to discuss your requirements and we'll help you get the best out of our on-line buying system.